If you've been following me on instagram lately, then you know that I have become the waffle queen! Lately, I am obsessed with making waffles. My mother never made homemade waffles when I was a kid (world's smallest violin), we had the frozen kind in the yellow box (which were not that bad actually). It seems like everytime I turn around on social media, I see a waffle post, so it was time to buy a waffle iron. I decided on a basic, inexpensive, under $30 waffle maker, nothing fancy for now, I want to see if I am in love, before I commit to the more expensive fancier models. So far, I have been more than satisfied. 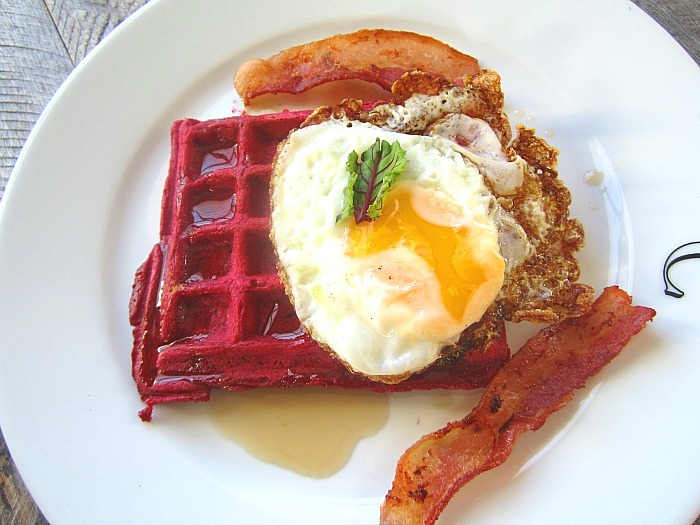 Savory waffles seem to have grabbed my attention. I want to put a fried egg on top, use some cheese, serve them for brunch w/ smoked salmon. 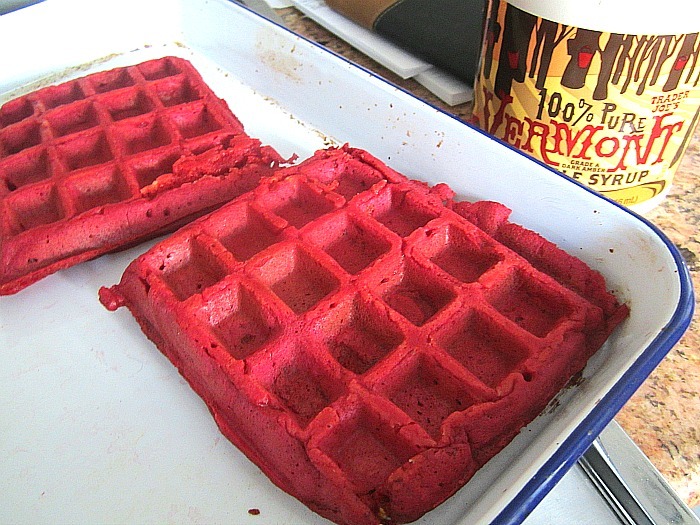 So for my first waffle post, I am serving up Roasted Beet Waffles for Valentine's breakfast (yesterday), and damn, were they good. Great idea if you have 2 leftover roasted beets (which I usually do). I promise you will love these. Roast the beets in the oven for an hour at 400F, covered (if you read my blog, you had better know how to roast beets by now!). Let completely cool, then peel. 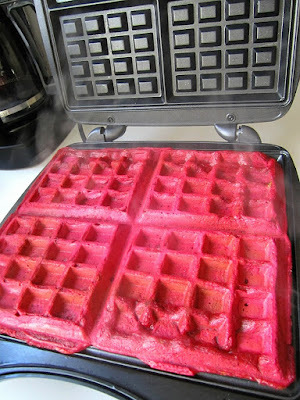 It's best to make the beets the night before, so they are nice and cold for the batter in the morning. 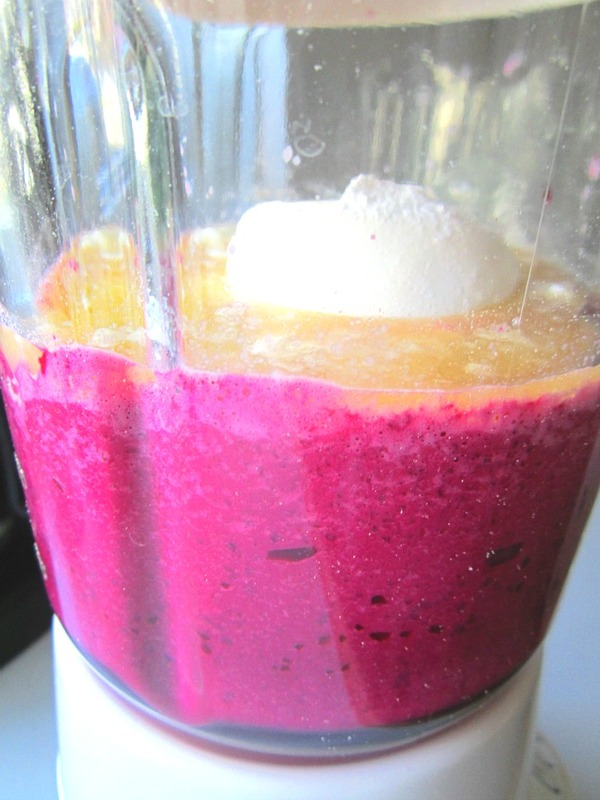 In a blender, add milk to the beets and purée. I tried adding in the rest of the ingredients to the blender, but it didn't mix, so I poured it out into a bowl and added in the rest of the ingredients by hand. To the beet puree, add in the cooled melted butter, the egg, the flour, sugar, baking powder and salt. Mix or whisk batter like you are making a cake or pancake batter. 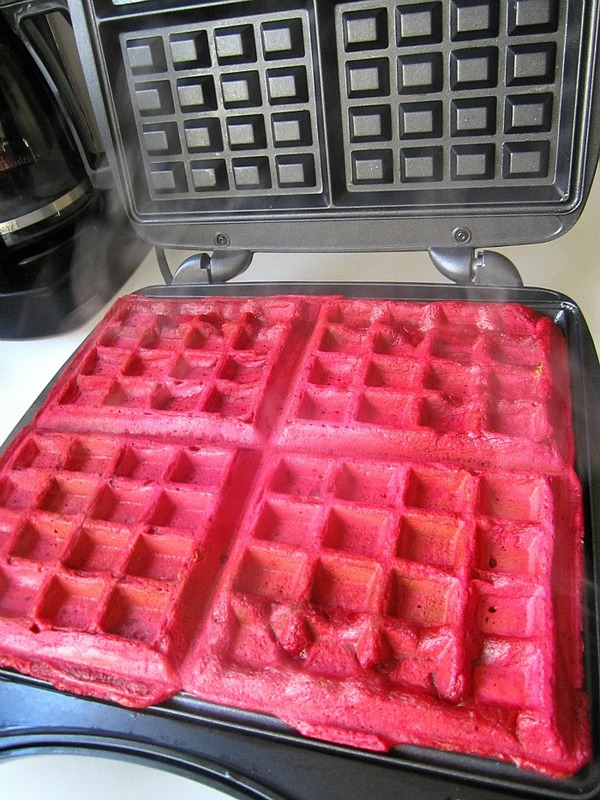 Pour batter into a hot waffle iron and press down lid. My waffles took 5-7 minutes. Serve with maple syrup and a dollop butter and maybe a strip of bacon and a fried egg! These are the BEST waffles I have ever had! I had a waffle iron when my kids were little, but it seems to have gotten lost in the move from our 1st to our 2nd house. That's, like, 15 years ago. You're an inspiration, Ms. Snacks! Unrelated to the beet waffles, but wanted you to know that I made your "My Favorite Summer Pasta" for dinner Friday night, February 12th. It was my second time making it and it was just as toothsome and incredibly delicious as the first time. Happy husband, happy me. Passed along to my daughter. Happy people numbers growing! Never thought of the savory waffle idea. May give it a try with pancakes first as we have no iron. In fact, we have no non-stick or aluminum cookware, use mostly cast iron and some stainless. Even have an iron ricer and bundt pan. Will see if there is cast iron waffler, if we like the savory pancakes first. Many thanks for all your posts and photos, they help me stay out of a rut and it is always nice to see others pretty creations. I am with you on the non-stick cookware front. I have only an omelet pan........I have gone to all stainless or Le Creuset (enamel lined cast iron) and even glass bundt pans (SIMAX), etc. I believe you can find an old fashioned cast iron waffle press, however, I think cleanup will be a challenge! I caved for this purchase, since it's a once in a while thing. 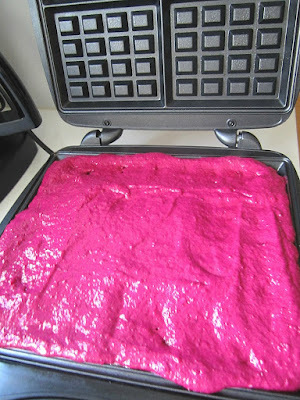 Beet waffles would be a non-seller in our household. DH thumbs down beets. That said, your inexpensive waffle iron will give you decades of excellent service. I have a Salton that looks v. similar except that it makes two larger waffle squares. I have had it at least 20 years, it cost $19.95, it is easy to clean. Even now when the teflon is aging, the only place that has to be cleaned is the plastic frame around the grids if there is an overflow. After pulling the plug, I slightly moisten a piece of paper towel, press out any excess water, and slip that into the part nearest the opening. Just on the “front” plastic, not the grids. In short order any spilled batter can be wiped off the plastic. This waffle iron’s standing for storage is a brilliant feature. I used to have a cast iron waffle iron with a gorgeous chrome case. $$$$ A nightmare. If the seasoning wasn’t just right, the waffles stuck, and on and on. 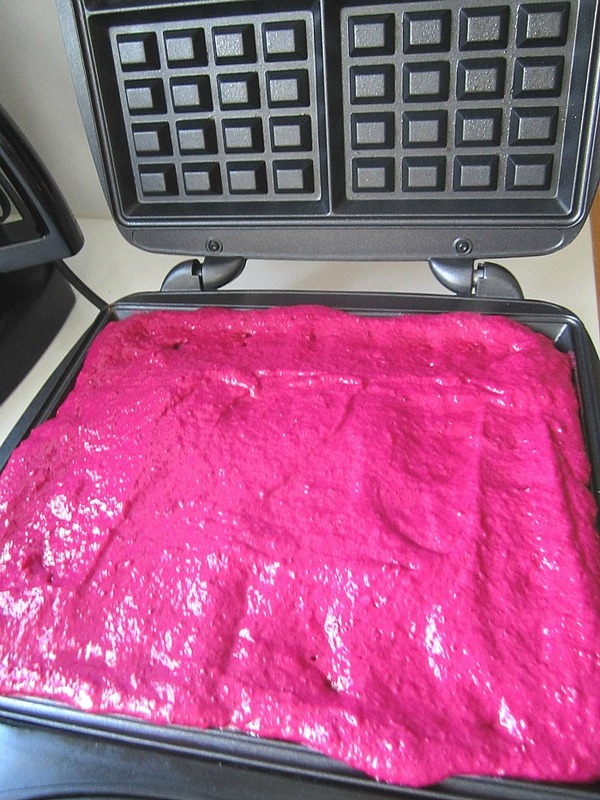 Your waffle iron is a gem. Hug it. I just gave it a hug and a kiss! What a cool idea - one I never would have thought of. We've had a waffle iron the last few years but generally only pour pancake mix into it. 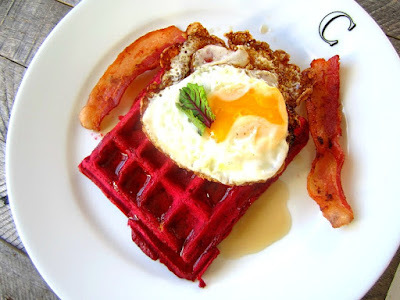 Last year, one of my daughters decided to try out a few different recipes with a waffle iron, but none as clever as this one! Those would make gorgeous ice cream sandwiches. My waffle iron is round and works beautifully but I like your square one better. These were the best waffles I ever had. Thank you for posting. Now I would like to make a batch for a small dinner party. I have never doubled a recipe before. Any suggestions? Can this be all put in a high speed blender without cooking the beets or does cooking make beets sweeter? I used similar recipe with beet stems uncooked, in high speed blender. In that recipe I only used oats, water, flax meal, honey, salt and vanilla. You have to cook the beets, either roast or steam them. 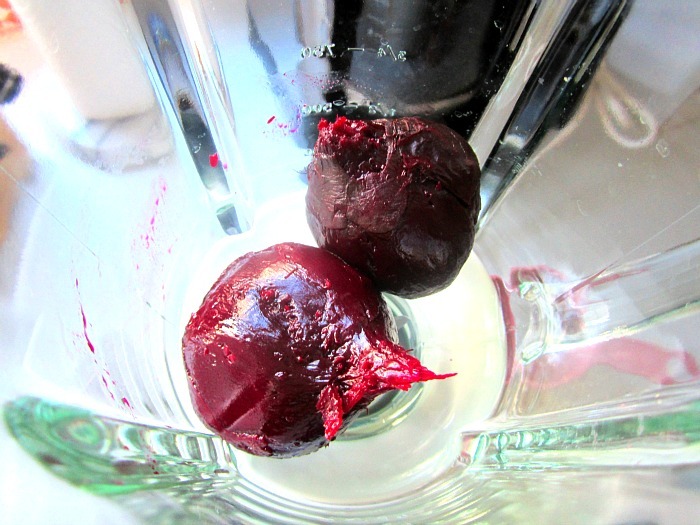 Raw beets are not sweet enough, and will not work in this recipe.